By the time we got into the line to take the Skyfari back to the Polar Bear Plunge, the crowds at the Zoo had grown. A lot longer line at the Skyfari was the first indication, but once off the ride, so were the numbers of people in front of the white bears. This big guy decided that a sun bath would be a great idea, too. 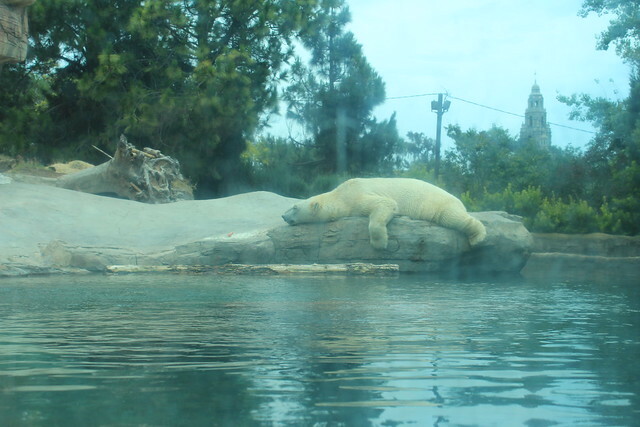 One improvement I noticed, since the Polar Bears moved into nicer quarters at the Zoo, was that their white fur didn't have as much green as it used to have. The chlorine always turned the bears' fur blue, or green. 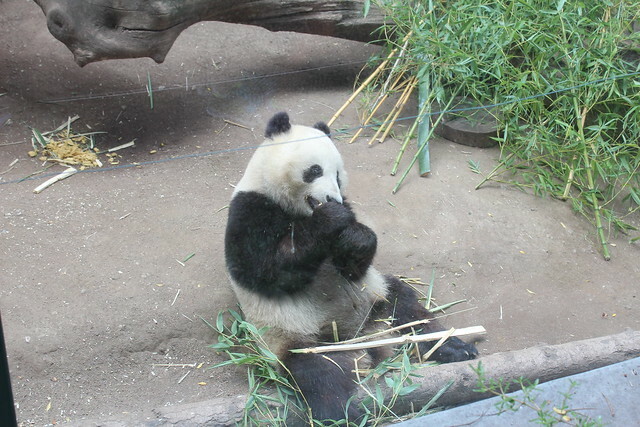 From there, we made our way to an animal that I've never seen: the pandas. When we were here before, years ago, the pandas were never out. 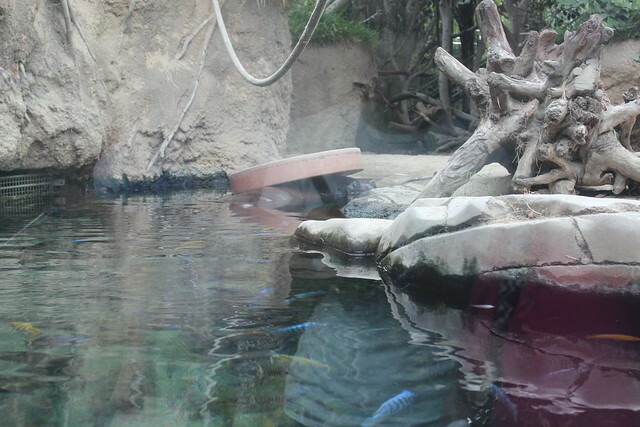 I don't believe I've ever seen them in other zoos, either. So the 20-25 minute wait was worthwhile. While standing in line, I got to talking with the people behind us. We had several places in common, where we've lived over the years. Small world! This big fella decided to entertain us by rolling from one end of his enclosure to the other, right in front of the observation window! 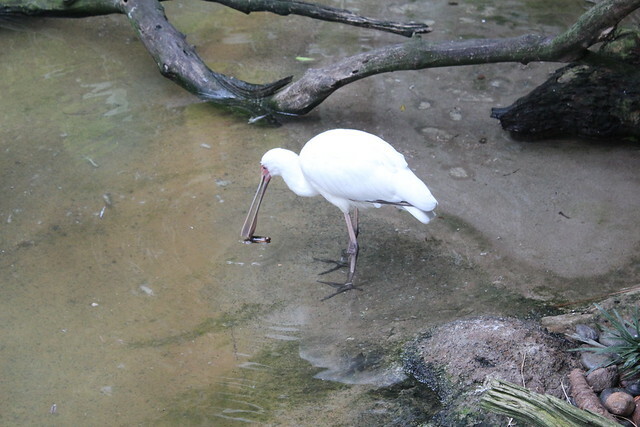 This spoonbill entertained us by playing with a little piece of wood. 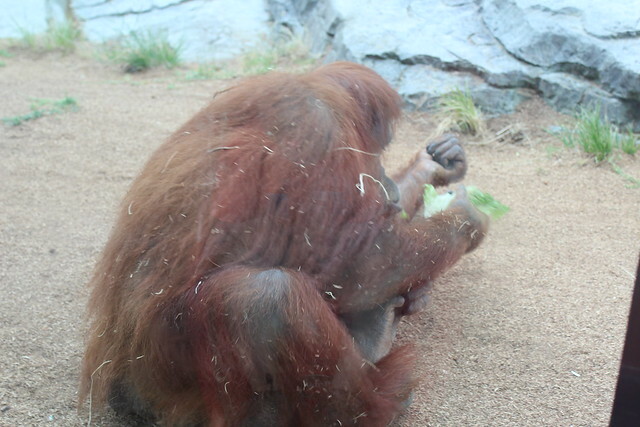 The gorilla habitat - Large, beautiful, green. 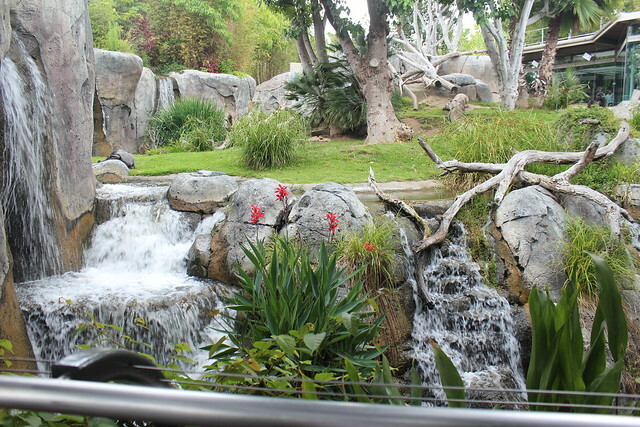 This is what San Diego Zoo does best: shows off critters in an environment that is similar to what they'd live in, in the wild. Look carefully. 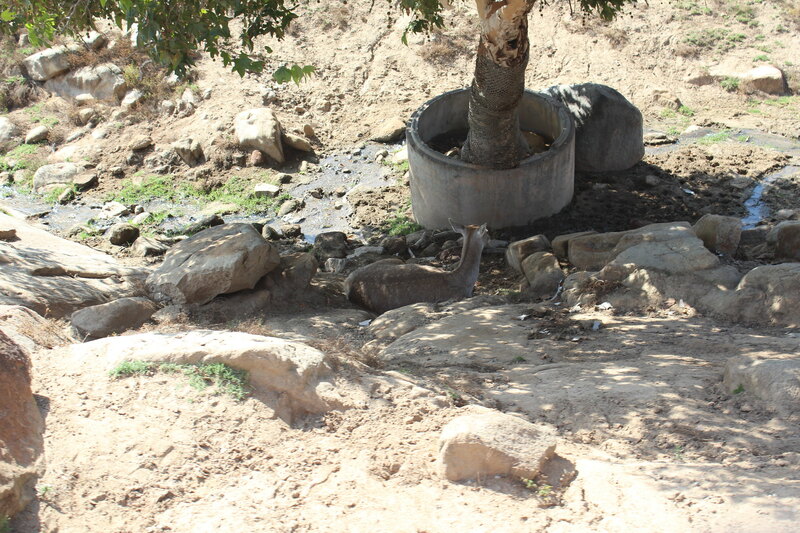 In this picture, under that pink "wheel" (on its side), is a hippo. While standing in line, I got to talking with the people behind us. We had several places in common, where we've lived over the years. Small world! I too was reminded of that recently. Picking up some items nearby, which had been advertised on Freecycle, I was chatting with the donor who was obviously from the US. When I asked where, I was told PA - a big State, where in PA? Near Philadelphia. When I drilled down a little deeper, turns out she is from Doylestown. Now if I had never bought that van, I still may not have known where that is. She was stunned to hear that I had been there. 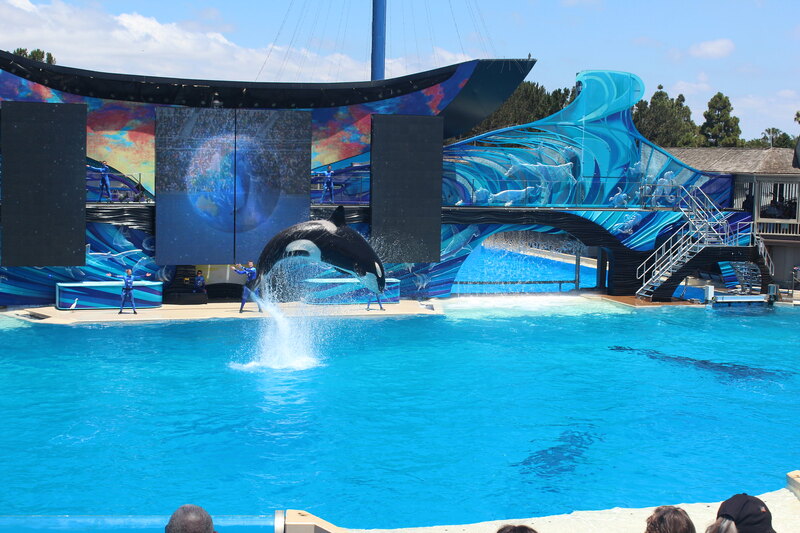 I know I've shown Sea World in two separate places in this thread, but today's post will be regarding three of their shows, and one more ride. 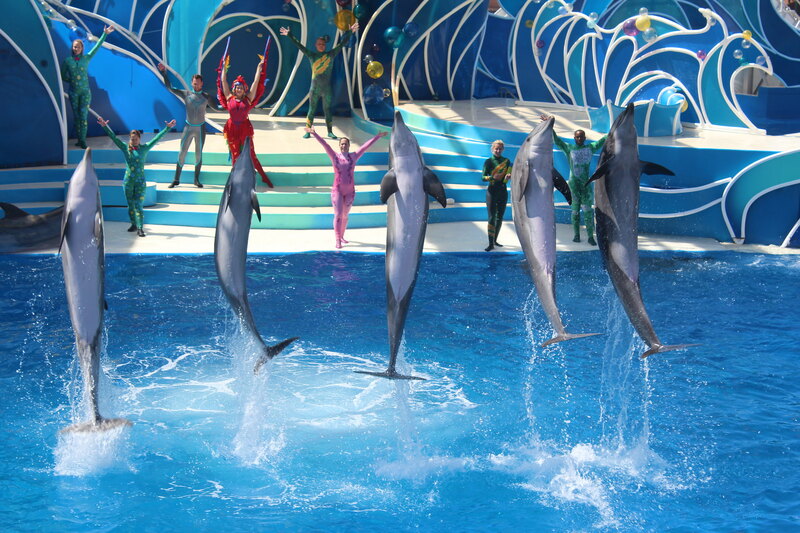 Sea World has gotten a bad rap in recent days, some folks blaming the training for the shows. 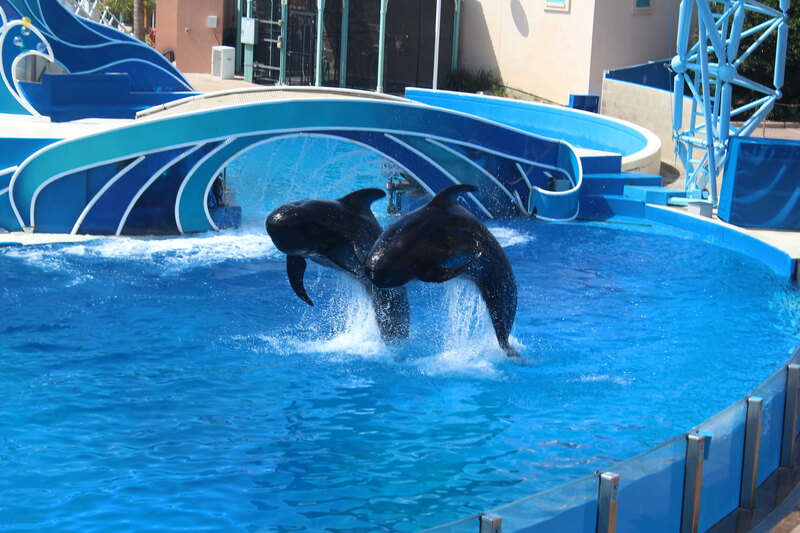 Sea World is claiming that they are a rescue operations, training some of the creatures with love and positive reinforcement in order to show the public what we need to preserve. 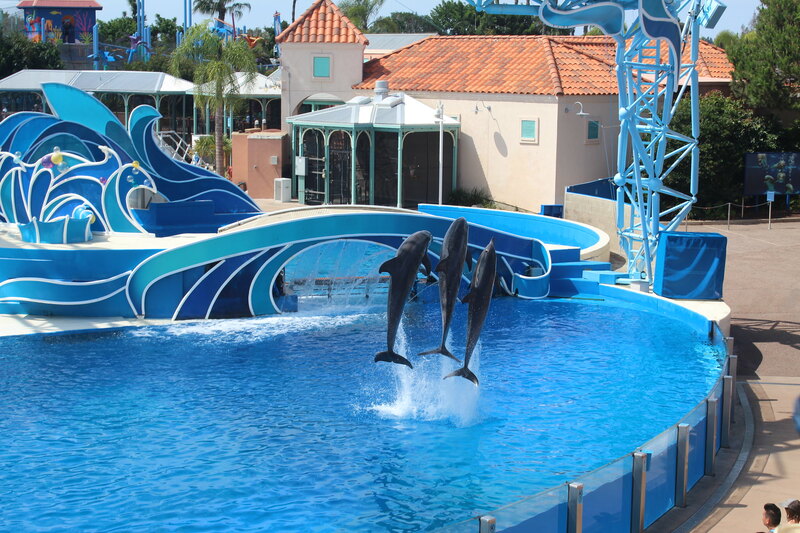 Our first show this morning was the dolphin and small whale show, Blue Horizons. We were entertained, pre-show, by a singer-guitarist who attempted to get the audience involved. Then came the show. This year, there were things added that I had not seen in this show, 5 years ago: aerialists, and divers. 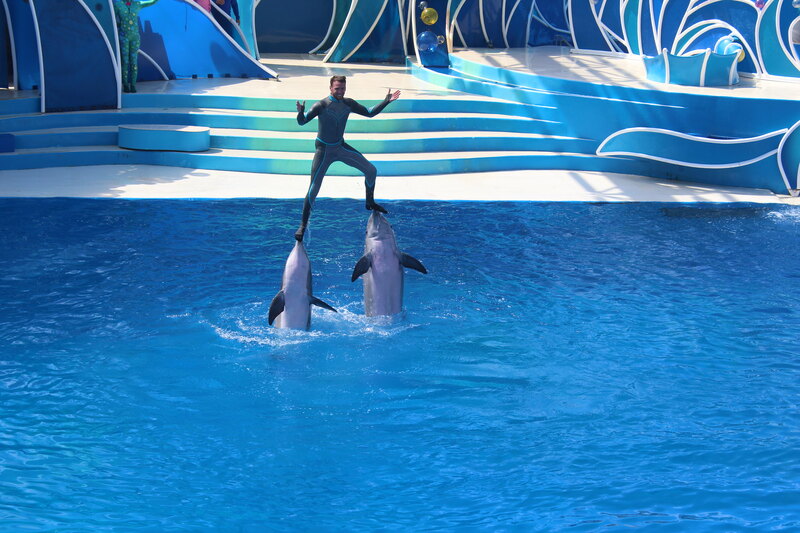 I enjoyed the aerialists just as much as the dolphins doing the fun jumps, dives and twirls that they'd do in the wild. 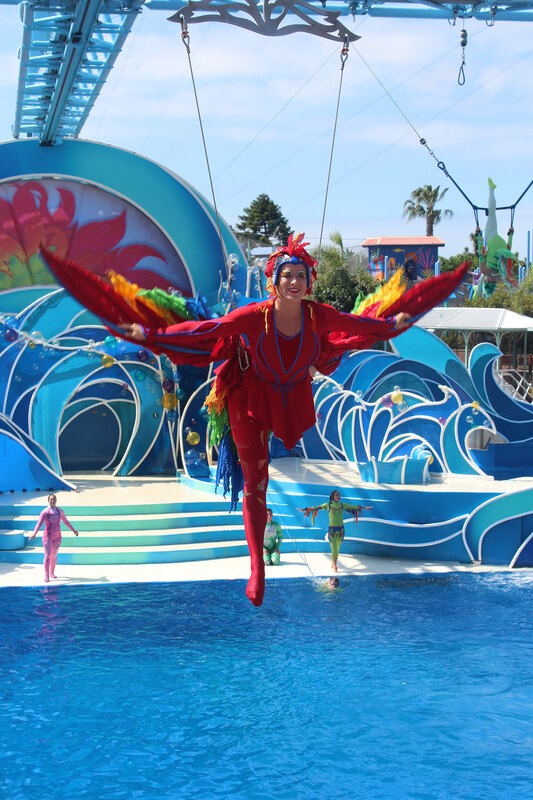 The aerialists in the show were all portrayed as birds. There were real birds in the show -- some invited and trained by Sea World, others that I would term "freeloaders", looking for free fish food. The small whales also did their thing in this show. I loved watching them jump, and trying to capture them in the photos at their peak. After the Dolphin show, we were walking over towards Shipwreck Reef (thinking about lunch) when we saw that the line for the Skytower ride was almost non-existent. Yet the tower was working! 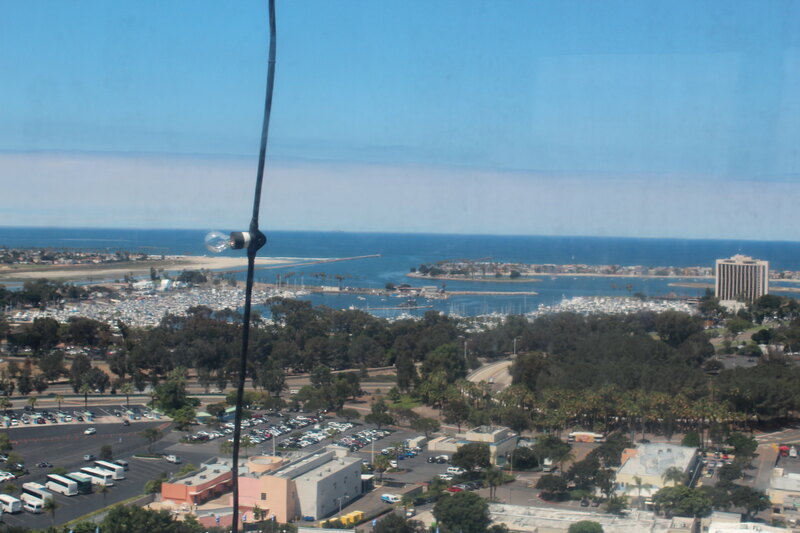 Beautiful views of the San Diego and Mission Bay area, yet one could only photograph through Plexiglas. 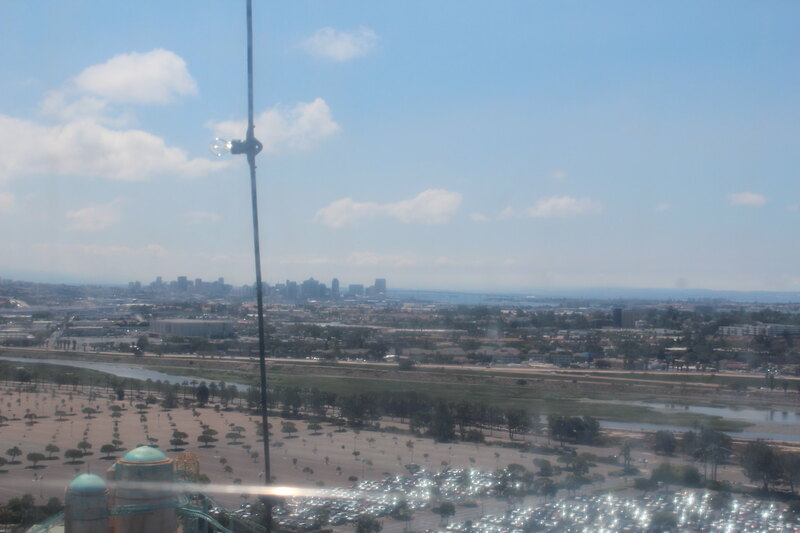 In the foreground of the first photo, you see the Sea World parking lot (which was more than half-empty today), but in the distance, you can see the skyline of downtown San Diego. We had lunch at Shipwreck Reef Cafe, and managed to find a picnic table in the shade. In this area of the park, there is also a white water rapids raft ride, called Shipwreck Rapids, but not wanting to get soaked, we just watched. 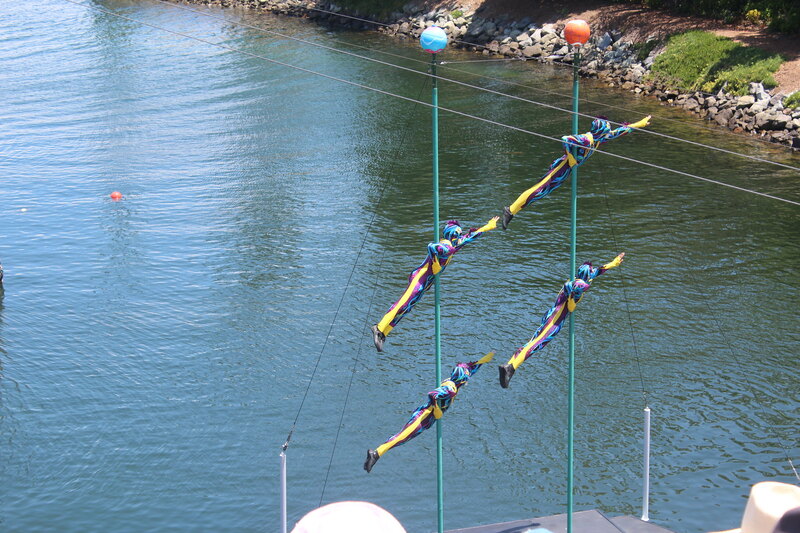 Then we headed for the next show, a summer-only show called Cirque de la Mer. We wanted to see one of the Cirque shows, when we were in Las Vegas two weeks ago, but the prices were a bit steep for our budget. 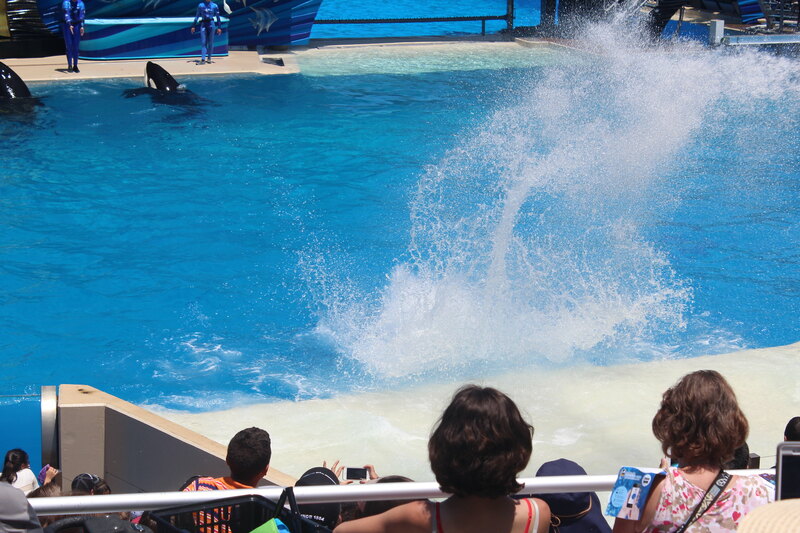 This show at Sea World filled in the gap, even though it was just a 25 minute show. Once again, there were some beautiful aerialists, great trampoline artists, good tumbling, and a few other good talents in these young people. 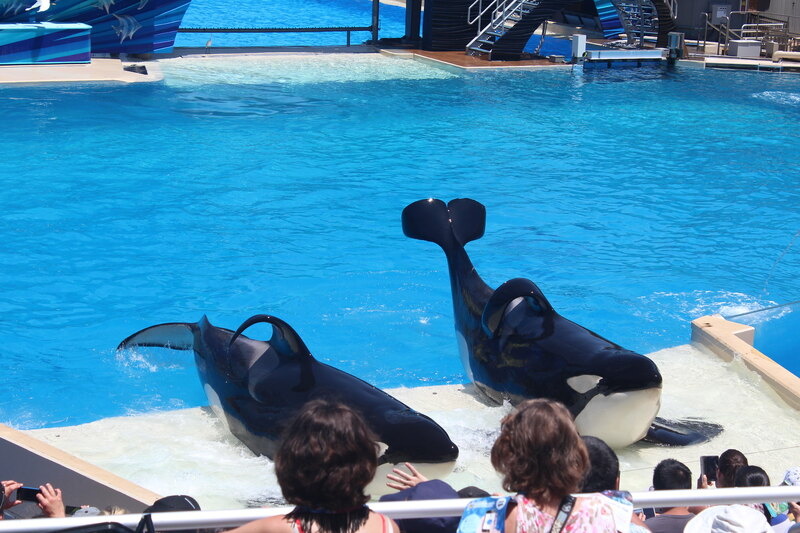 A trip to Sea World would be missing something without a trip either to see the orca whales in their pool, or by seeing the fabulous orca show, AKA "Shamu Show". We got there early, baking in the hot sun while waiting. 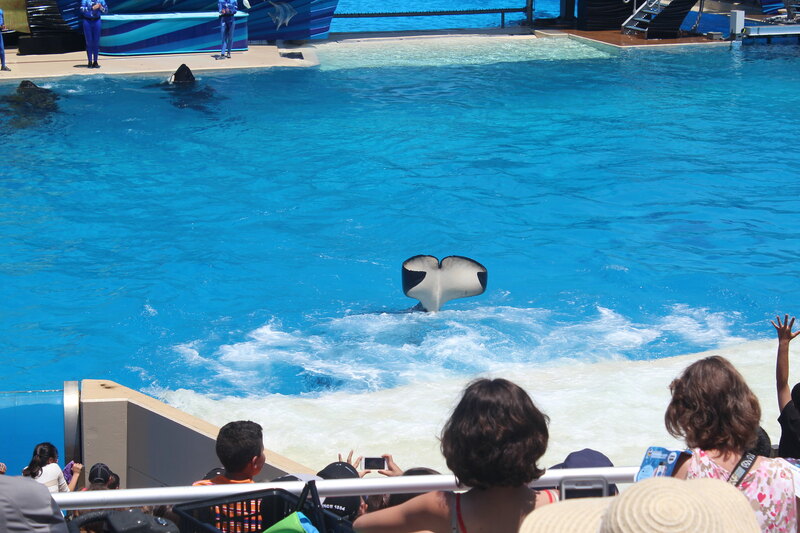 I regret that I don't have nearly enough Shamu photos to choose from, though, as I had to change my camera battery in the middle of the show. 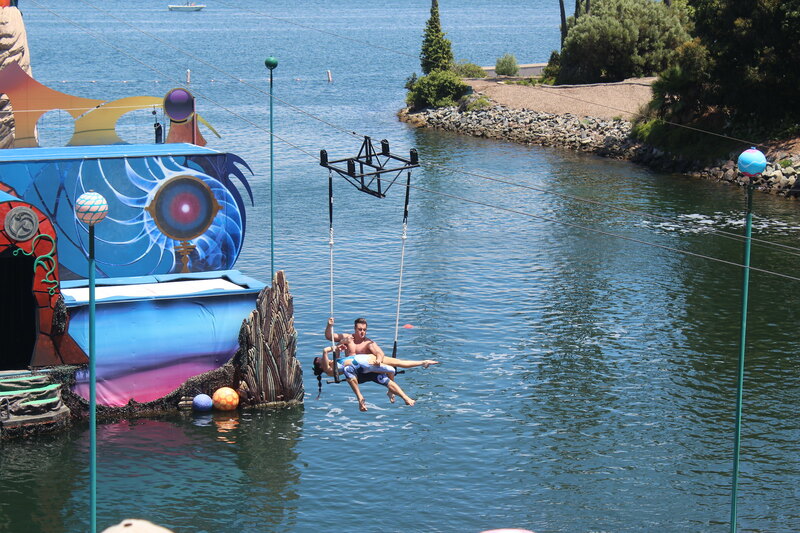 A highlight of many Sea World shows, for many folks, is to sit in the Soak Zone and wait for the creatures to get you wet. 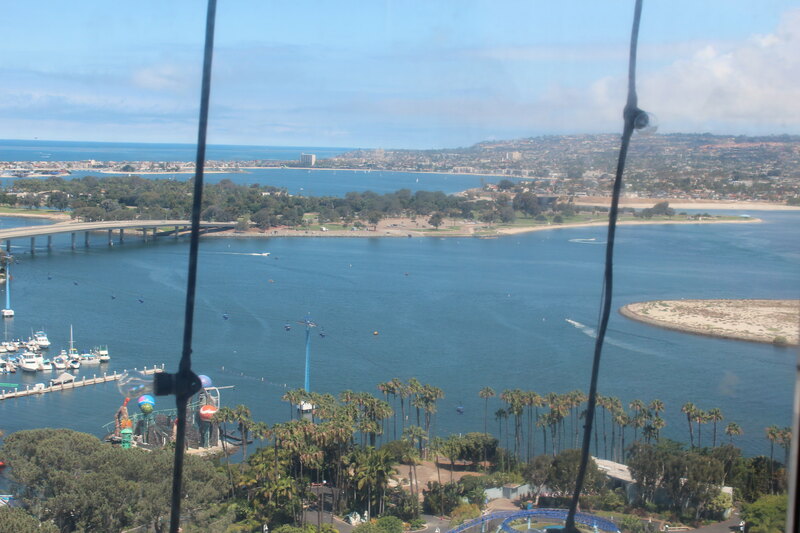 In all shows today, we sat up high enough to be out of the Soak Zone (and in the Sweat Zone, because of the sun and humidity today). Ours was a short day, but we headed home shortly before 2. 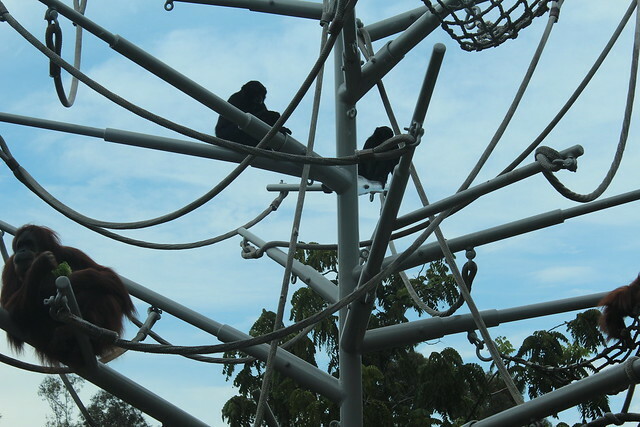 We'd done what we wanted to do, and know that this fall, we may return on a weekend sometime to catch the Sea Lion Show, the sky bucket ride, and a few other things we've missed. Renting a vehicle, locally - things learned! With more family due in later (today), we decided a number of weeks ago to reserve a mini-van in order to haul everyone around (and their stuff). None of our own vehicles would comfortably hold 5 adult-sized people. Notice I used the word *comfortably*. Indeed, two of our vehicles will each seat 5. But when one is a teenaged girl, probably not. We also wanted luggage room, as we will be heading to Santa Ana (Orange County) as part of this trip. As I've done for years, and we advocate on these forums, I shopped around for several months before we actually made the decision to rent and made the reservation. I checked prices on the different discount travel sites, the individual car rental agencies, and Costco Travel, and finally found a reasonable rate on a minivan. We didn't want to go with the same people we rented from, two years ago, because of the distance to pick it up and the fact that their vehicles are not the newer ones, plus the fact that as a local-only agency, we might be stranded if something went wrong with the vehicle. Finally, we ended up going through Costco Travel, whose rates were a good 25% lower all around than any I had come up with. But then I had another issue: when you are renting from a non-airport agency, you contend with the fact that they are NOT open 24 hours for pickup and drop-off. So we had to figure out where to rent from that was open for pickup on a Saturday and to drop off after 3 on Saturday. The latter was impossible -- all of our local places are closed around 2 pm on Saturdays, most of them closed by noon. We ended up with Enterprise, but the need to keep the vehicle an extra day (more $$) because they can't let us drop off when they're closed. This monstrosity is no bigger than our pickup; as a matter of fact, it's about a foot or so shorter in length, probably a few inches shorter in height in the back only because we have a camper shell on ours. It is loaded with a lot of bells and whistles. It will be fun to get to know the vehicle, and to drive a vehicle that's newer than 13 years old (our babies) for a week or so. Will keep you posted. Update Sunday: it will be interesting for the rest of the summer. I broke my arm yesterday when I tripped and fell in the airport. It's just a hairline fracture but right at the joint. As a result, I am typing one-handed. I can still do a lot, just with one hand. 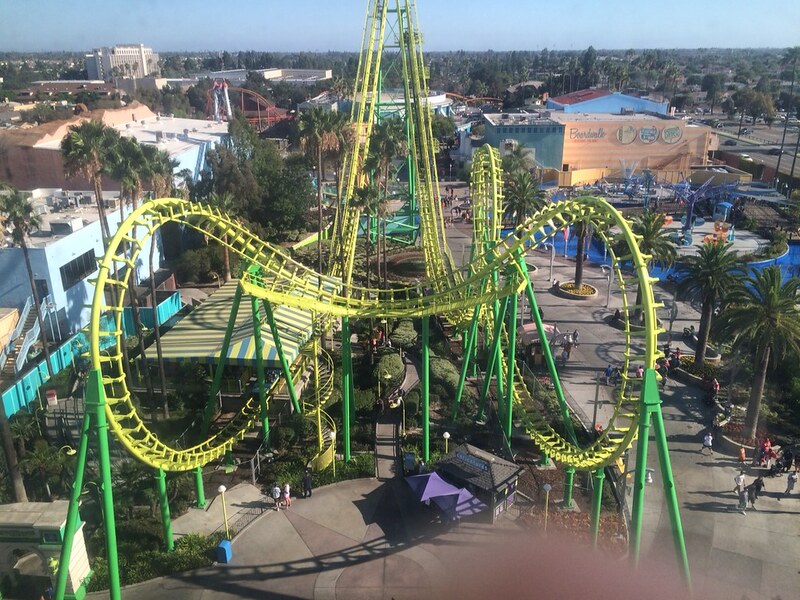 On Sunday, we headed up for Buena Park to be able to do Knotts on Monday morning. Due to awful traffic, it took 2 hours to make the 90 min trip. It was stressful on all of us. We settled in at Radisson Hotel, which added to the stress. They had our prepaid reservation, but when we went to bring things to the two rooms, three out of the four elevators were out of order! When we all tried to get wifi, we were unable to get devices to find a signal at all in the rooms. If that wasnt enough, we were given 4 bath towels but only one washcloth and one hand towel. For 3 people! The pool was lovely...we had gone up early in order to use it. Four of the six said the water was a perfect temp, and the other two didn't get in it. 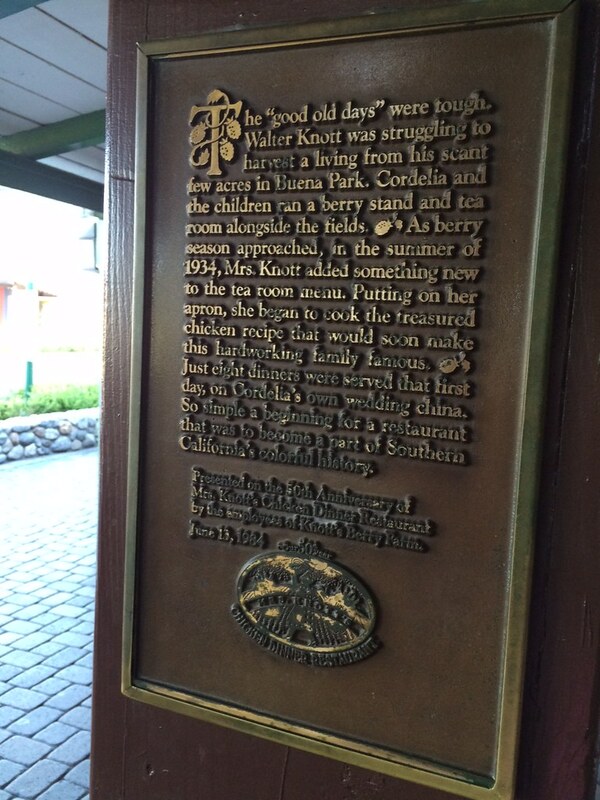 Dinner was down at Mrs. Knott's Fried Chicken. That's what everybody had except two. Dinner at $19.99 sounds expensive until you realize that you get both soup AND salad, your meal with your choice of vegies, and a choice of 5 desserts (pie or ice cream). It's about the best fried chicken in the USA. 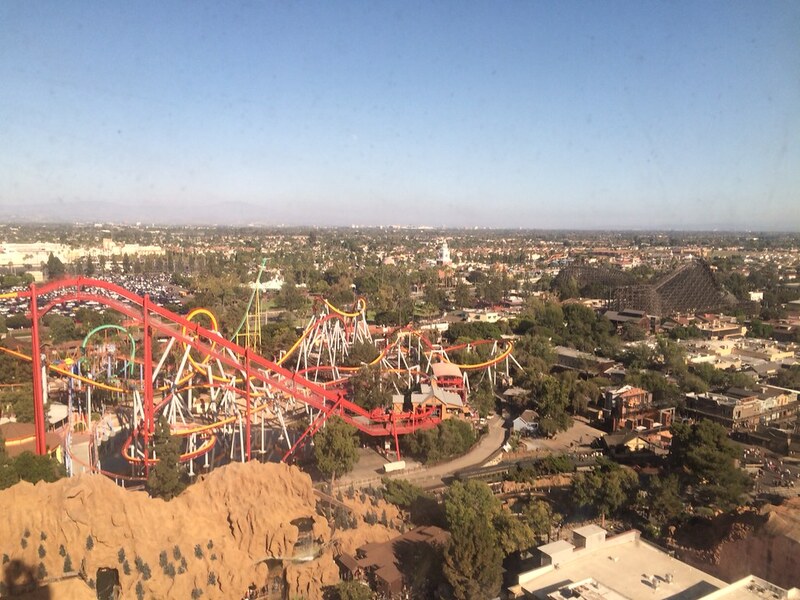 The next morning, after breakfast at IHOP (the hotel charged $12 for their buffet), it was off to Knotts. Parking was $17 for the day. We met our son-in-law up there. 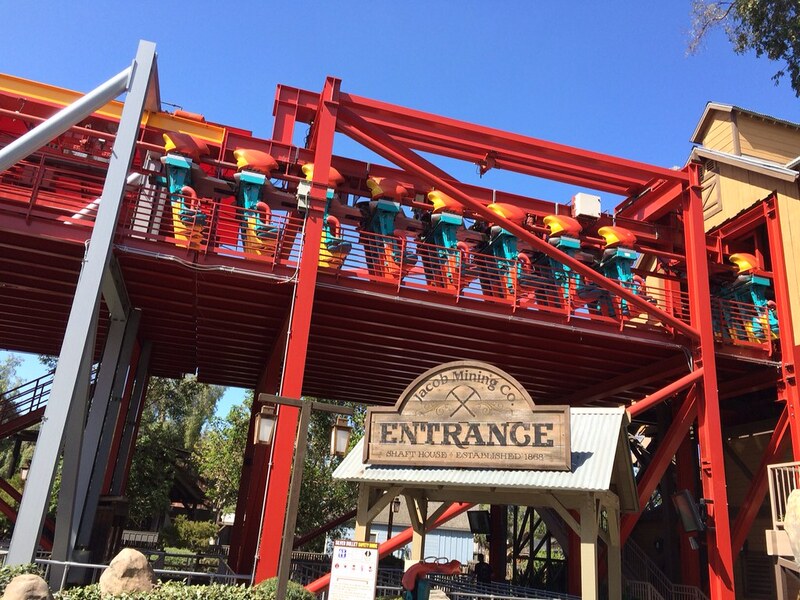 Four or five in our party liked various thrill rides. I enjoyed visiting with my sister-in-law since she was not a thrill ride person and neither am I, even when not sporting an arm splint. 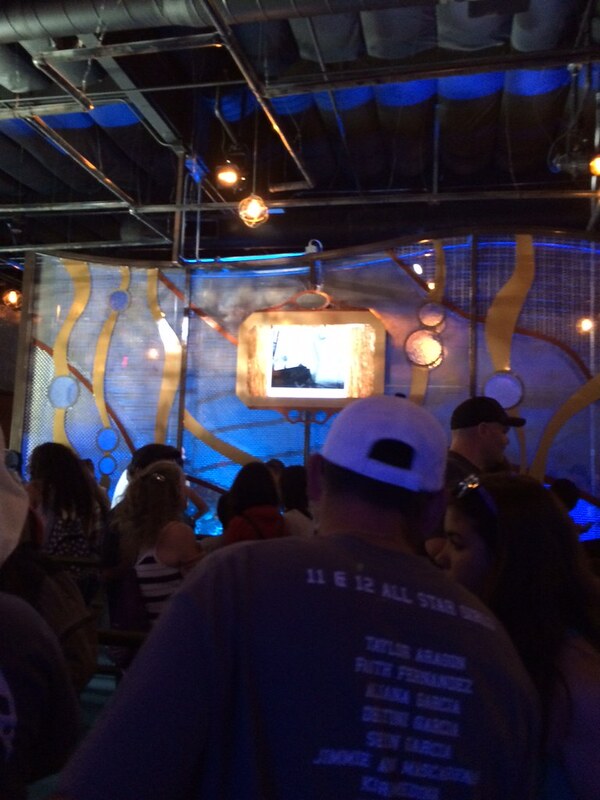 After a few of these, we all went on the Voyage of the Iron Reef, an interactive ride. However I let my Bro-in-law take my controls as my left hand wasn't up to the challenge. Then it was a show. We did the Snoopy ice show, 30 minutes of fun. My daughter used to skate and discovered that someone from her home rink was in the show. After the show, lunch and more rides. 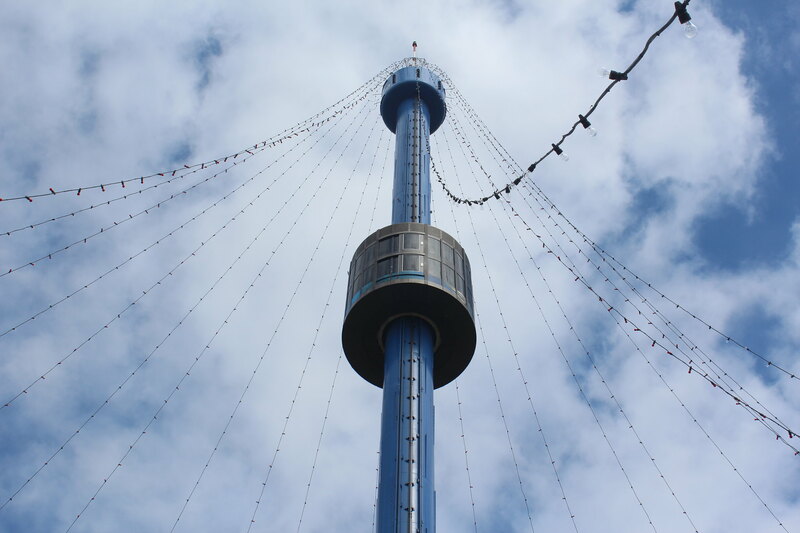 I rode the Sky Cabin while others did thrill rides, and my sis and bro in law rode with me. Great views! We finally left about 7 pm , visited gift shops, and headed home. Got home about 10pm. 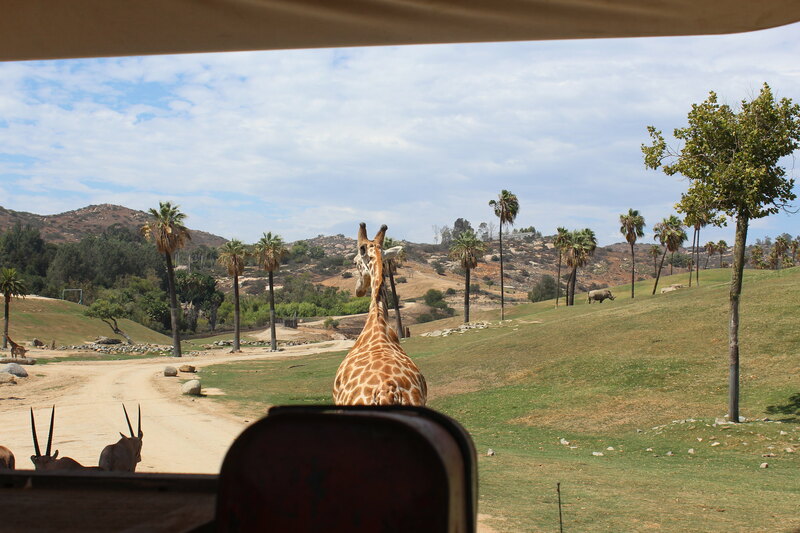 Here is another park that I have written about, before: San Diego Zoo's Safari Park, AKA "Wild Animal Park" to the locals who have lived here since forever! Rather than more about the same, though, I am going to talk about something we did on Wednesday that most of us had never done before: The Caravan Safari tour. This is a truck tour where they take you into the compound where the animals actually roam, and you ride in an open air truck. My sis-in-law decided to treat all of us to this tour in honor of my bro-in-law's birthday yesterday. It was so COOL! You load the truck, get the safety spiel, and are taken out onto the compound first in the African area. 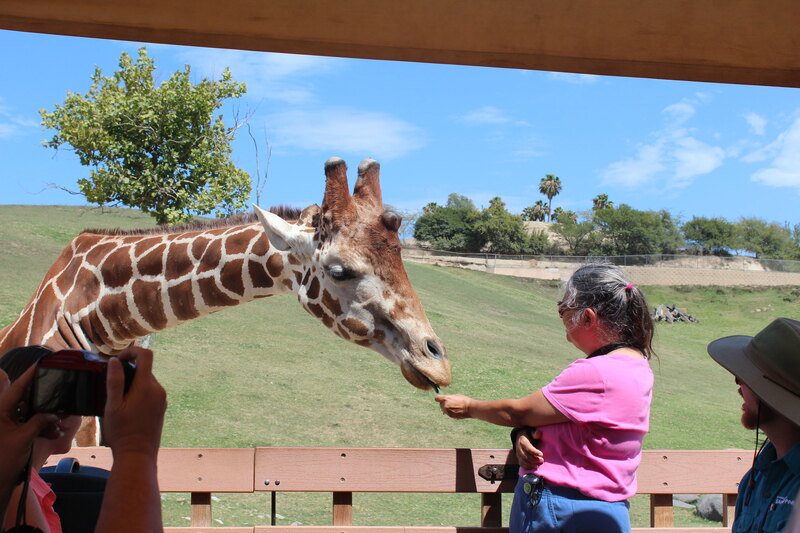 There, one of the highlights was for everyone to get to feed a giraffe if they so desired. We weren't even sure, at first, that the giraffes were going to be interested. 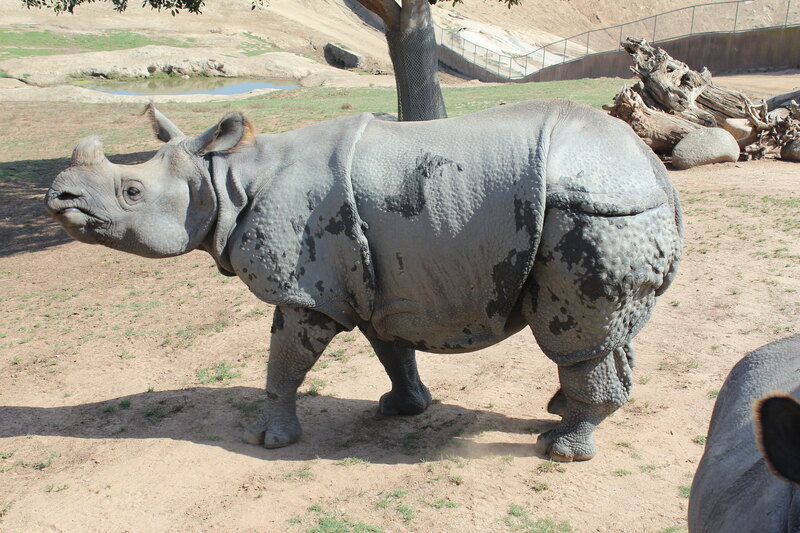 We were able to see many other animals up close, such as the rhinos, endangered species in the deer family, and more. Incredible photo opportunities on this caravan, but there is also a photo caravan available .... for more $$$ of course than this one. 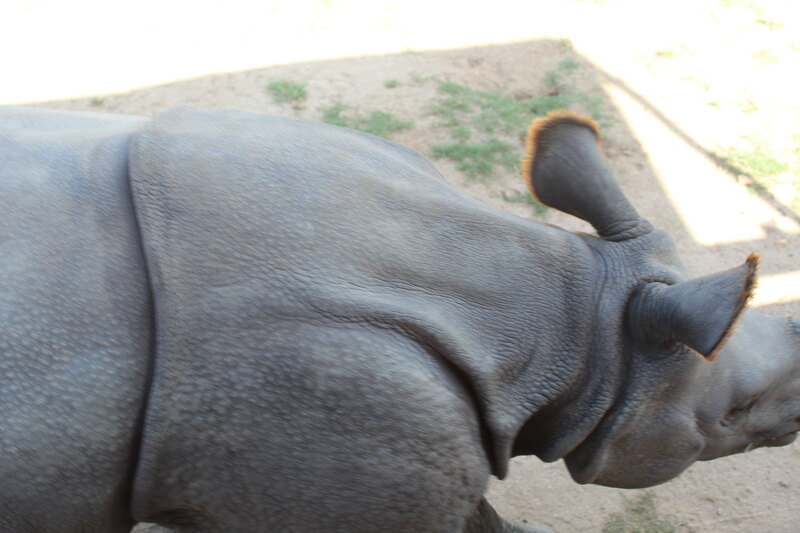 I had no idea that rhinos had hair on the edges of their ears, until I saw one up very close. Some folks got to reach out and touch this one, but I couldn't reach over comfortably because of my arm. 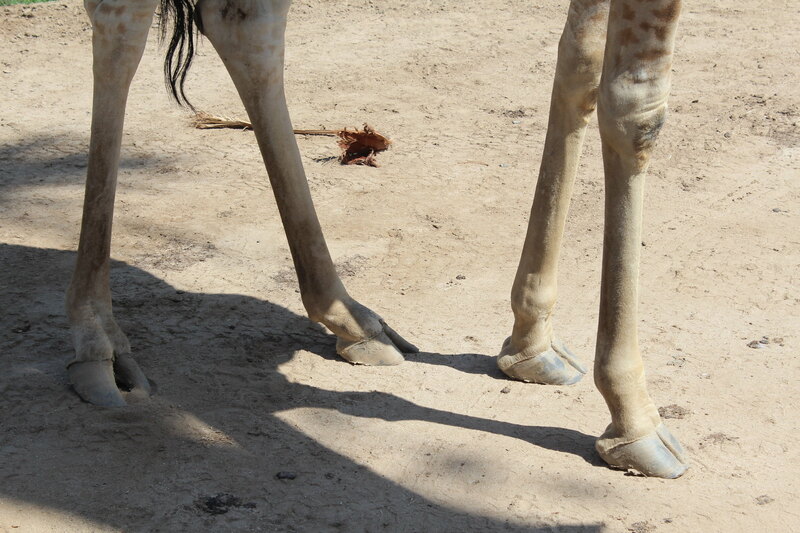 I also had no clue about the sheer size of giraffe feet. 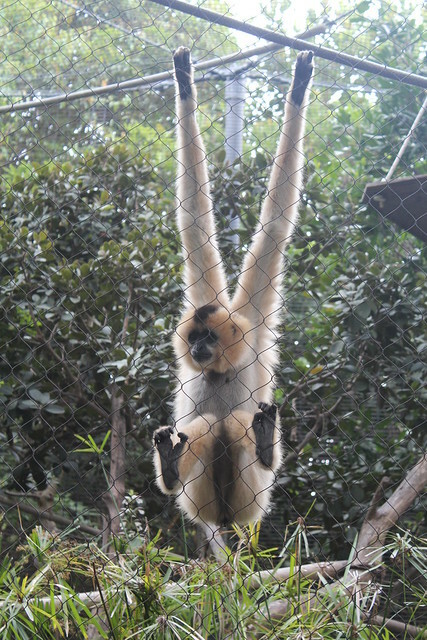 Just seeing them from the tram, or over the fence at the zoo, does not give you this close up view like the Caravan tour does. There will be no Thursday report. Everyone has gone off to the beach. It's the same beach I wrote about earlier in this thread, and I have NO interest in getting sand into my splint! This should conclude the StayCation report. I don't keep expense reports for these. School starts in a couple of weeks for me. I will be starting it with a splint on my arm (broke the radial head on my right forearm) and being careful about my eyes. Yesterday I had to endure laser eye surgery to repair two tears on my left retina, both because I landed on my chin when I fell on Saturday. So no hiking, and my computer time is limited due to eyesight and arm issues. Great report, so much to do in San Diego area. Your report gave a good 'Insider's Guide' to top attractions. So sorry to hear of your recent injuries, hope the recovery is quick! And I hope the start of your school year goes well.